iOS 9 beta 5 download for iPhone, iPad and iPod touch is now available for registered developers enrolled in Apple’s Developer Program. We have all the details on how you can update right away, including the changes which the new beta update brings with it. The fifth beta of Apple’s latest and greatest mobile software for iPhone, iPad and iPod touch arrives exactly after two weeks when the fourth beta was released. And on the face of things, it’s pretty evident that iOS 9 beta 5 is a pure bug fix and performance enhancing release, nothing more. If you have one of the previous betas installed on your iPhone, iPad or iPod touch, then you grab the latest release right away without having to connect it to a computer. Simply launch the Settings app on your iOS device, navigate to General > Software Update to grab the latest pre-release build over the air. We suggest every user who has installed iOS 9 beta before to update right away, as releases such as these tend to bring with them a lot of fixes, making the overall usage experience a far better one than before. 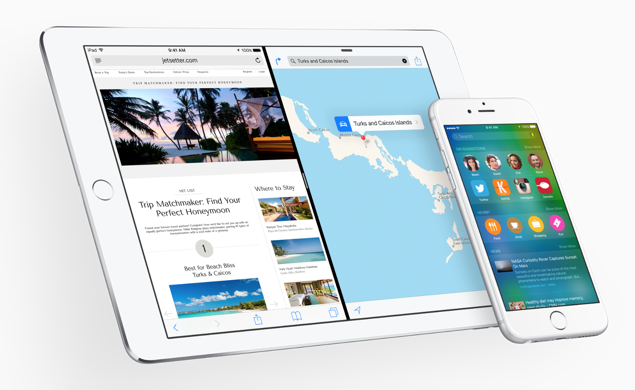 Where can you download iOS 9 beta from? We’re glad you asked. Simply head over to the Apple Developer Program website and you can grab the beta bits from there. Remember, to access and download pre-release software, you have to pony up $99 annually, which is not much, considering you get access to big releases before anyone else. Despite being a major release, iOS 9 supports an array of devices, with the now ancient iPhone 4s too making the cut in the list of supported hardware, along with the iPad 2 as well as the original non-Retina display iPad mini. Apart from releasing developer focussed beta builds, Apple also has a public beta program running alongside too, allowing average users to jump right into the action as well. If you’re willing to give iOS 9 a shot on your iPhone, iPad or iPod touch, then simply follow our guide posted here: How To Download, Install iOS 9 Public Beta On iPhone, iPad. We recommend that you don’t install beta builds on devices which are your daily drivers, since they can be very unstable at times. But given how much stable iOS 9 is in its current form, we’d go as far as saying that you should give it a shot at least once on one of your devices just to see how the future of iOS looks like. There are 15 new wallpapers to choose from, with no new Dynamic ones. Calendar app now has a new splash screen. Keyboard shortcuts are now called ‘Text Placements’ in Settings > General > Keyboard. Certain old wallpapers have been removed in this release. New ‘Shuffle All’ option in Music app. The iOS keyboard has received a slight makeover. WiFi Calling for AT&T users makes the cut in this release. New ‘WiFi Assist’ feature has been added which smartly switches to cellular data when WiFi connectivity is poor. CarPlay now works nicely with Beats 1 and Apple Music. You can now like tracks as well.